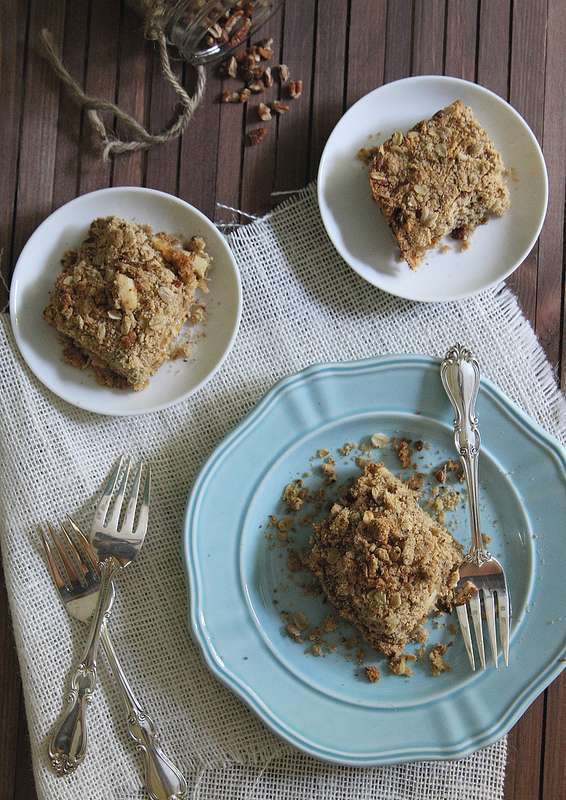 Enjoy a mixture of savory and sweet in these apple cheddar crumble bars. I spent the past weekend in Maine with a group of fitness & food bloggers representing Cabot in the Beach to Beacon 10k. Besides the race, we drove around in red and black plaid Cabot vans, visited one of the 1200 Cabot farms, stalked met elite runners and ate A LOT OF CHEESE. I thought I would be seriously sharped out, but I couldn’t shake the idea of cheddar + apple pie from my head after Nick, one of the Cabot team members who was with us this weekend, mentioned the combo. I like apple pie/crumble and I like apples + cheddar as a snack. This is it’s offspring and it’s a wonderful combination of savory and sweet. I’m not sure how much more awesome you can get when you already drive around in a plaid van that says “random acts of cheese” on the side, but Nick managed to do so with this recommendation. Epic. 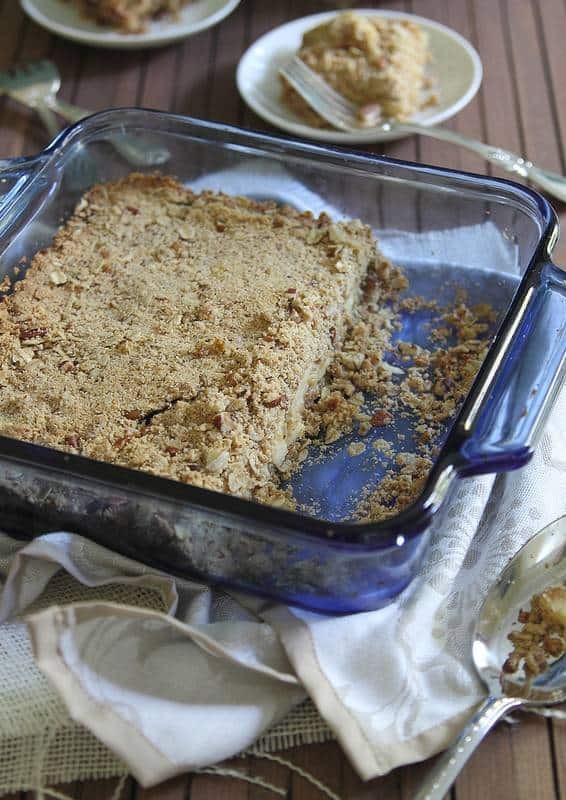 Enjoy a mixture of savory and sweet in this apple cheddar crumble bar. 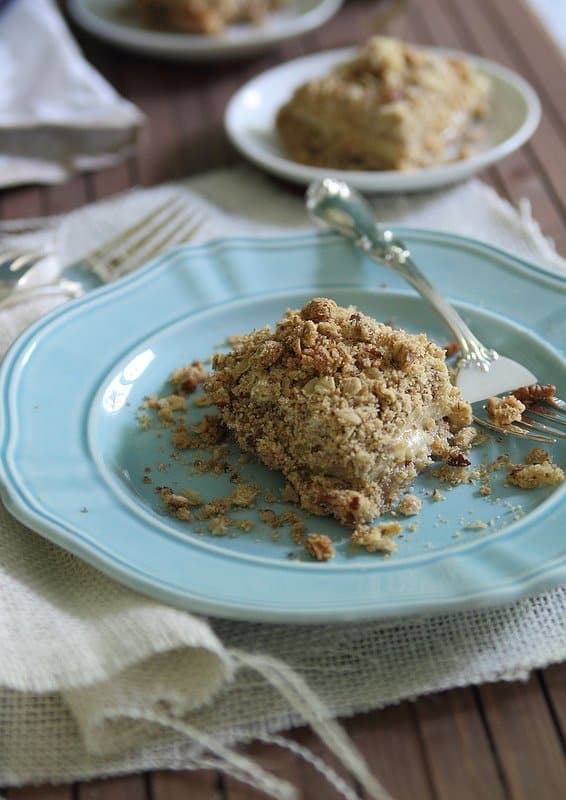 In a large bowl, combine oats, whole wheat pastry flour, almond flour, brown sugar and baking soda. Mix together with a spatula and then cut the butter and milk in with your finger tips until the mixture is a "crumb" texture. Pour about 2/3 of the mixture into a 8x8 or 9x9 baking dish and press down firmly with your hands or the bottom of a glass to form the base of the bars. Layer the cheese slices on top with enough slices so that the crumb mixture is completely covered. Lay the apple slices on top of the cheese. Add the chopped pecans to the remaining crumble mixture and pour on top of the apples. Press down firmly again to form the top of the bars. So glad you made these, I love the apple cheddar combo and these look awesome. I had a blast this weekend and hope our paths cross again soon! Never tried apple cheddar combo. It certainly looks great. Dang Gina, these bars look incredible!!! 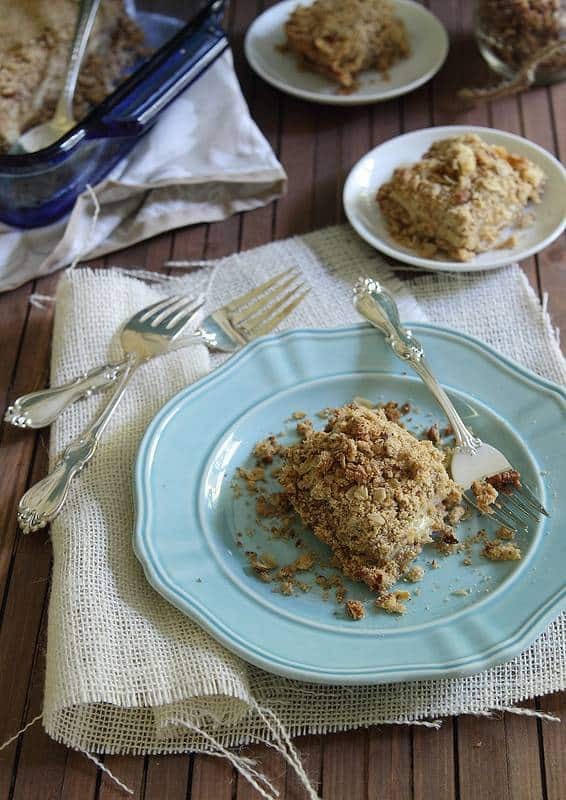 I love apple + cheddar anything, and the crumble sounds amazing! Oh yum! What a great combo! This looks amazing! I love apple and cheddar together! I love it! I love salty/savory in my sweet and I am pinning these pronto! With that recipe you become an official New Englander! Can’t wait to try it. What a great combo. I would have never thought of adding cheese to this but it sounds fantastic!! Oh my gosh, oh my gosh! I drooled so bad over this – I cannot believe that somebody but me would like the idea of cheese in an apple crumble. Need to make this! These look amazing… Curious, since they have cheese, should they be stored in the refrigerator after baking? I am thinking of bringing these to a picnic this fall. Yes, I stored them in the fridge.